The International Wood Fair takes place every two years in Atlanta, Georgia. 11 Gator employees attended all 4 days of this year’s show. It was a great opportunity to learn about changes in the industry, visit with vendors and share meals together as a team. Hundreds of vendors attend the IWF to display their hardwood lumber, plywood, screws, glue, hinges, kiln dryers, sawmills, beam saws, CNCs, robots and so much more. The visual favorite for the Gator team was the colored Mdf. produced by a new manufacturer, Foresco, Ltd., from Korea. The coolest technique the team witnessed was the digital scanning of lumber to then press it into a veneer. 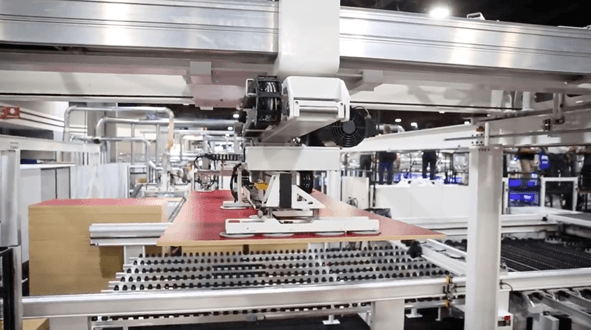 One of the most interesting aspects of this year’s show was seeing how many new plywood suppliers have been able to jump into the market in the past few years. Vendors from Russia, Eastern Europe, South America and Vietnam all had representatives attending and showcasing new varieties and offerings not regularly seen since China has had a hold on the market. Vietnam showcased a new product called a Baubuche Panel X that really caught everyone’s attention. This 1 ⅜ x 27 x 13’ long panel is great for countertops, exposed core, shelves, beams and more. The solid beech product is very stable and shows promise as a great new material. Stay tuned as different members of the Gator team provide their overview of the fair from their unique perspectives.